Welcome to our horse portraits in detail horse gallery. Here you will find a variety of in detail photos of our horse portraits from the last few years. As you may already know from looking around our website, we specialise in oil paintings and pencil drawings of horses. Many of the in detail photos below show our hands and paint brushes working on the portraits to help give our clients and readers scale to the artwork. All of our artwork is traditionally hand painted and drawn by ourselves. We sit for many hours at a time working on the painting and drawings. We have a purpose built studio in our woodland garden and its lovely, cosy and warm. We are surrounded by wildlife, it,s a beautiful place to be creative and to paint and draw your portraits for you! We hope you enjoy looking at the up close and in detail gallery of photos of our artwork below and if you have any questions please don’t hesitate to email us at any time! The close up and in detail photos of the horse portrait below was commission in 2018 of a beautiful horse called Elly. Our clients commissioned a 24 x 18 size oil painting which is a wonderful size to have a horses head study painted. As you can see from the close up photos below, the amount of detail in the painting is beautiful. The portrait was traditionally hand painted in oils by Nicholas Beall. The recipient was thrilled. If you would like to read about the commission you can do so on Elly's Horse Portraits in Oil page. The race horse portrait below is of a stunning horse called Amosite. Returning clients commissioned a 20 x 16 inches oil painting as a surprise birthday present and the recipient was thrilled. As you can see from the close up in detail photo of the oil painting a lot of work has gone into the portrait. Why not read about the commission you can do so on Amosite's Race Horse Portrait page. My pencil drawing of Duker was completed in pencil and you can see the full portrait on my Horse Pencil Portraits page. the drawing was completed at 20 x 16 size for a client in the UK as a 70th birthday present. The recipient was thrilled! I hope you enjoy viewing the close up photos below. The in detail photos of the oil painting of Merchant of Dubai are stunning. Nicholas traditionally hand painted the portrait at 22 x 16 size for returning clients. We have our canvases made professionally so can provide any size of canvas for our clients. If you would like to read more about the commission you can do so on Merchant of Dubai's Race Horse Portrait page. 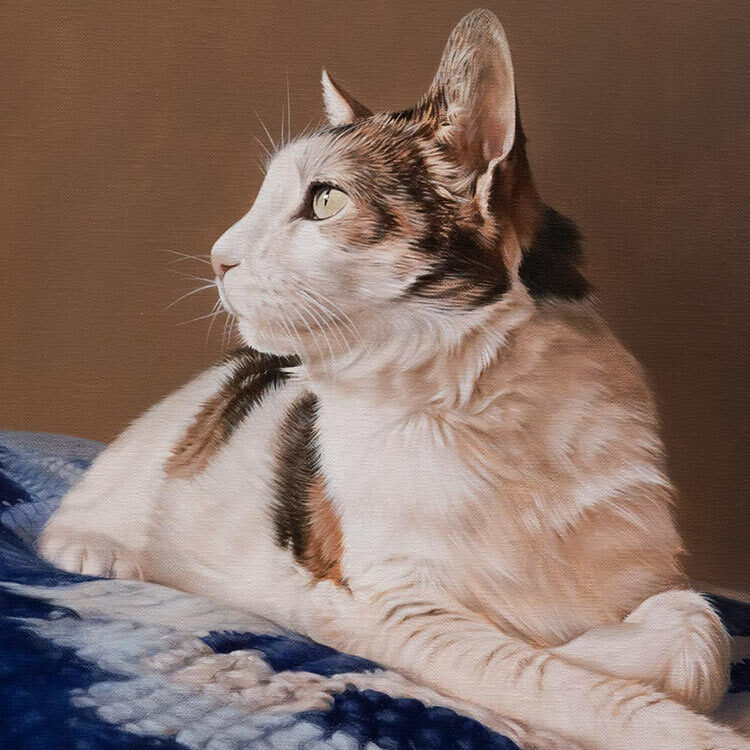 The close up and in detail photos of the oil painting of Remi really show Nicholas' painting skills beautifully. Another returning client, the portrait was traditionally hand painted 18 x 14 size to match three other oil paintings already commissioned in previous years. You can find out more about Remi and the other horse portrait commission on Remi's Horse Painting in Oils page. The portrait of Flash was completed in pencil by myself, Melanie, as a commission for a returning client based in Australia. You can read more about the commission on my collection of horse portraits on the Horse Pencil Portraits page. I hope you enjoy viewing the close up photos of the 30 x 20 inches drawing. Nicholas' oil painting of Inca Shannondale was completed in 2018 for a client commissioning an oil painting of his wife's horse for her birthday. You can read about Inca Oil Horse Painting page and find out about the commission and its details. As you can see Nicholas has painted this portrait very delicately, including all of the buckles and straps of the tack. This is an older portrait commissioned in 2014. Its amazing how fast the time passes as it only seems like yesterday Nicholas was painting all of the details of Leah's tack. If you would like to find out more about the commission of Leah, pop over to our Horse Painting Oil On Canvas page and read about the commission and its details. The portrait has arrived! I cannot adequately express my appreciation. I feel as though my sweet boy, Maximilian, is now here both in body and spirit. The resemblance is striking, the workmanship outstanding! You have captured his essence, heart, and character perfectly. I am forever indebted to you for giving me the opportunity to keep him forever close. We all still miss him terribly. I hope to put the portrait on his website with both (due) credit and links as well as soon as possible. I hope we can work together again soon for another portrait. Right now, I am just too overwhelmed..